It was our second day at the convention and, as we would learn, things would unfold a bit differently than the day before. 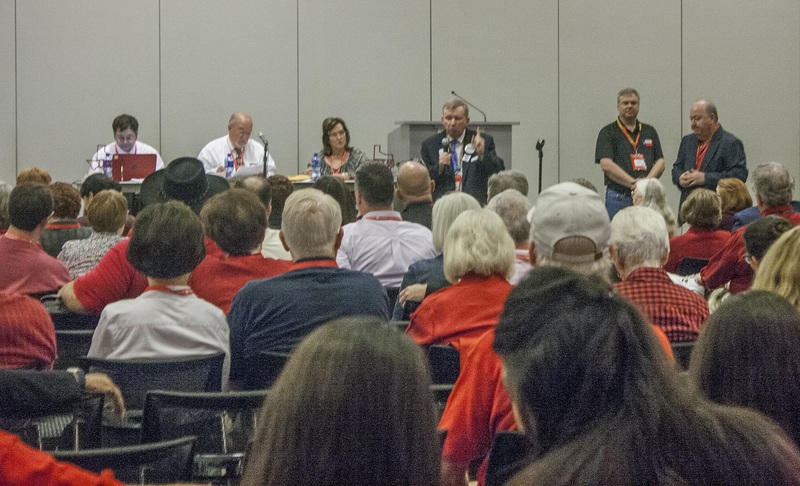 There was more entertainment, but more actual work, too, and that led to some discord in the party ranks–but, thankfully, not among the Walker County delegation, who remained pleasant even when disagreeing on policy issues. For the first order of convention business, we gathered inside the Senatorial District 5 meeting room. 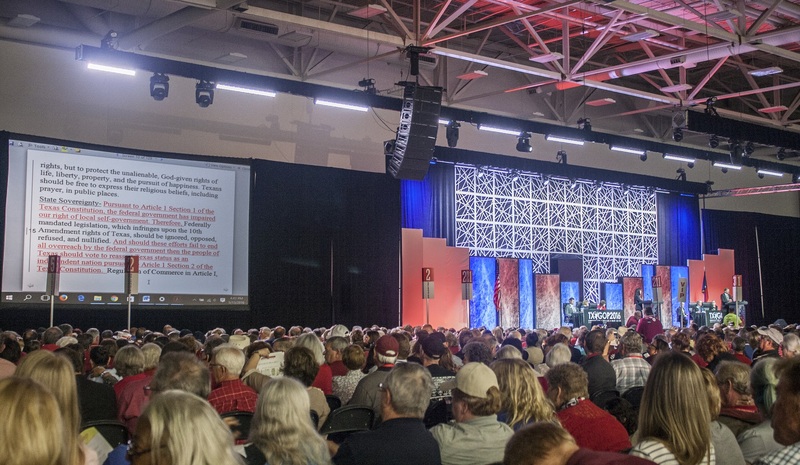 Here, the delegates would vote on state party leaders: State Party Chairman, State Party Vice chairman, State Executive Chairman, and State Executive Chairwoman. 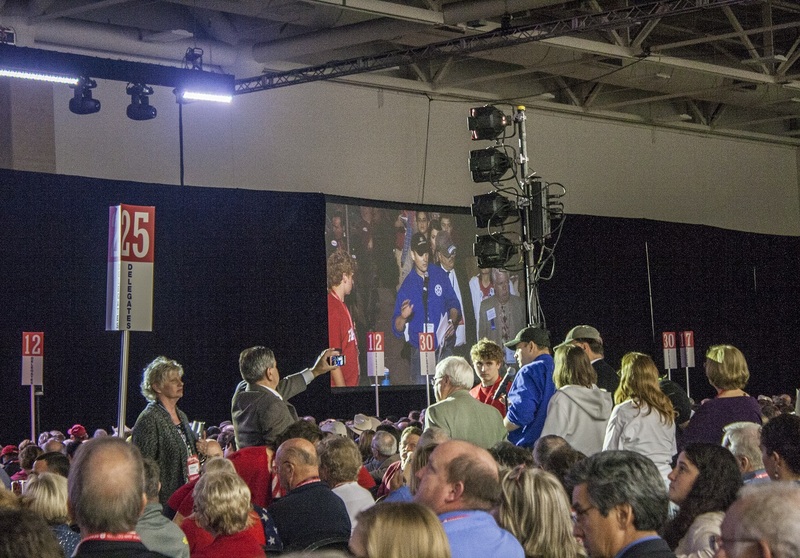 After the delegate seating process was finished, with a delegate count of 248, it was then permissible to commence voting and declare nominees for the different positions. Two nominations for state party chairman were made, one for Jared Woodfill and a competing one to keep Tom Mechler. 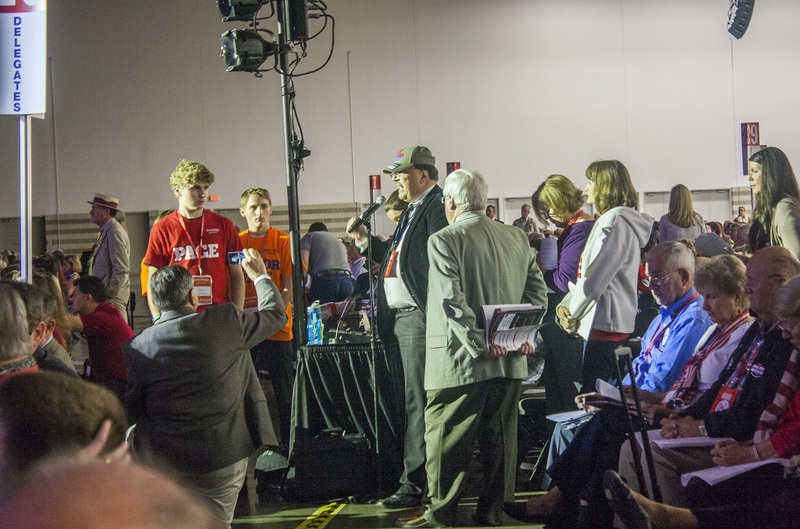 After the ballots were distributed to each county chair and the delegates gave their vote, it was time for the Senatorial Caucus chairman to announce the winner of this caucus. The rules, however, are a bit more complicated. 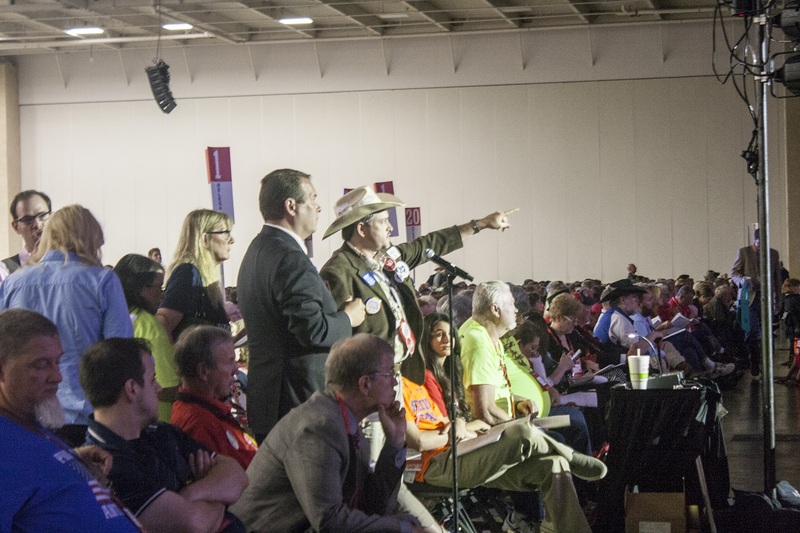 The vote isn’t to actually see who wins, but to see if candidates can achieve a minimum needed to be nominated from the floor of the convention. 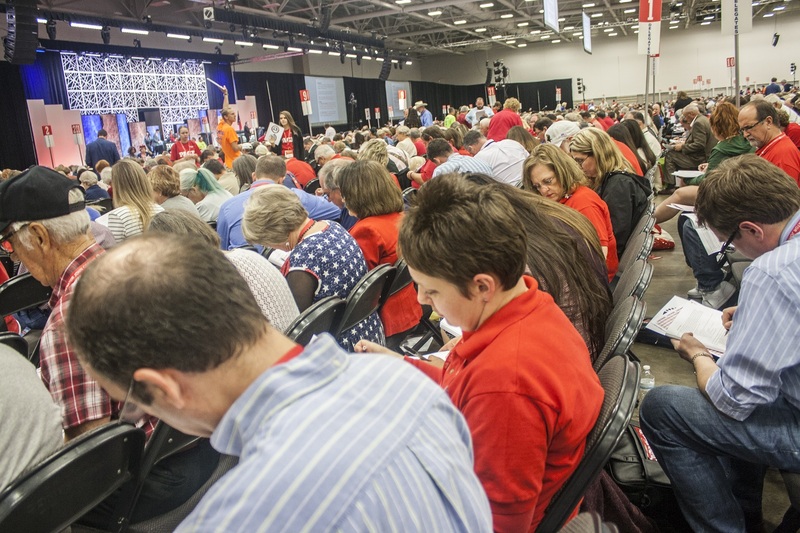 The minimum, as it turns out, is to achieve 20% of the overall delegate vote of all Senatorial Caucuses or to actually win three of the 31 caucuses. As it turned out, Mechler won our caucus. 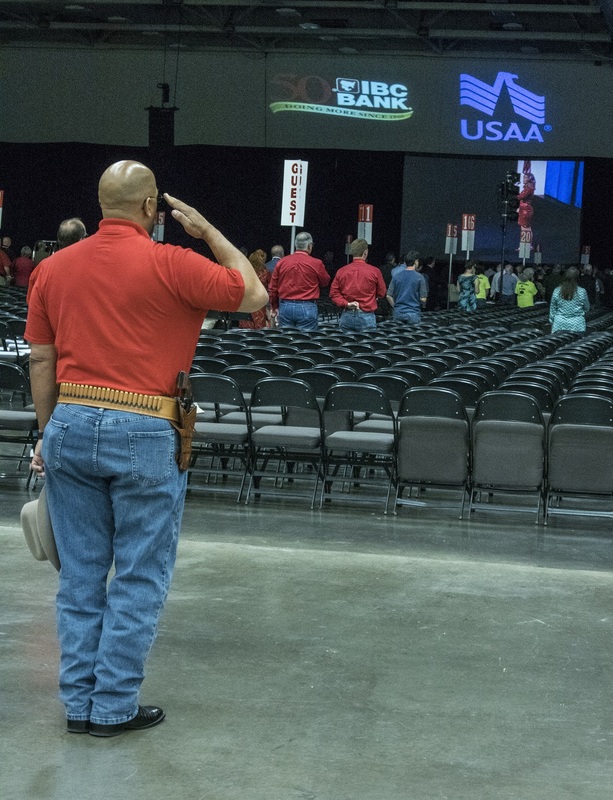 In fact, as we would learn later in the day, he won almost all the caucuses and he would handily defeat Woodfill as Chair of the Republican Party of Texas. 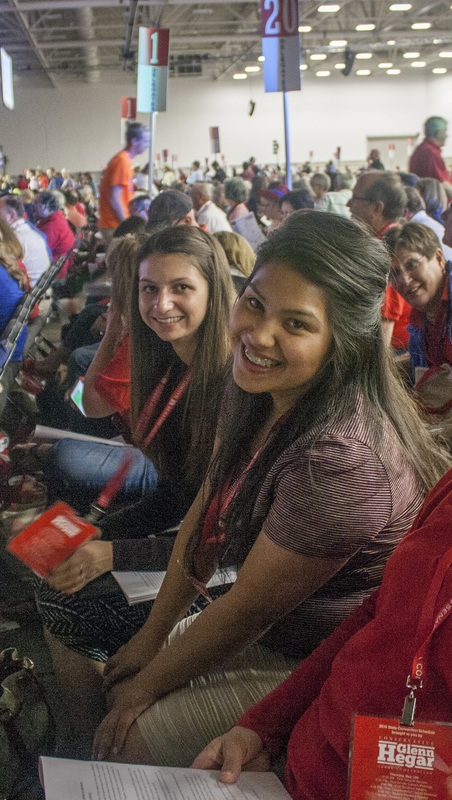 Before we got to the floor, however, the delegates received a rewarding speech delivered by U.S. 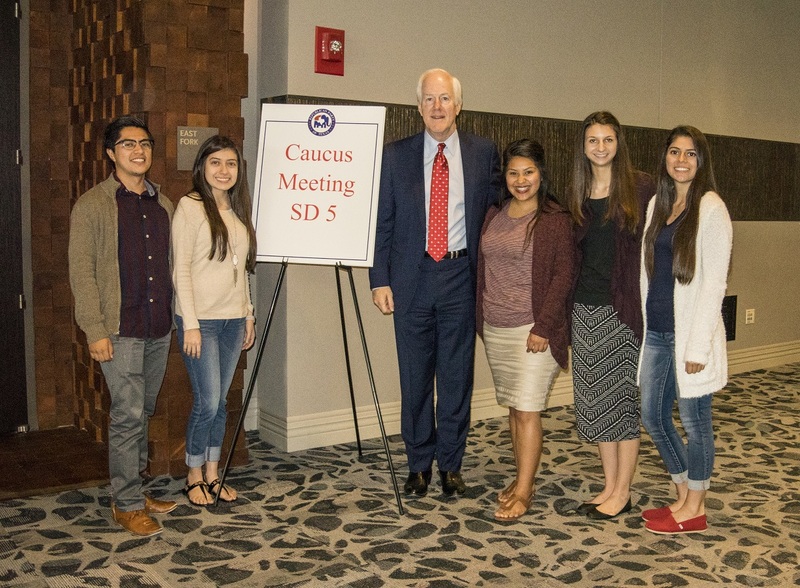 Senator John Cornyn. His delivery included his opinion on how the party is to keep strong in the upcoming years and received strong support from the crowd. This powerful delivery was all the more special for we were able to briefly meet with the Senator, a meeting that we were grateful for. Following our meeting with Senator Cornyn, nominations began for Vice Chair, a process that yielded Kathy Adams and Amy Clark. The delegates then voted 51 to 216 in favor of Clark. This, too, augured well for Clark who went on to win easily in the other Caucuses. 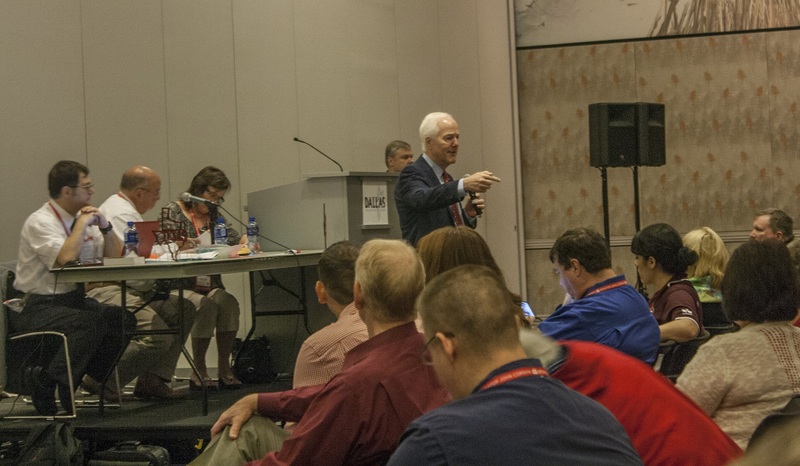 Mike McCloskey won the nomination for District 5 Executive Chairman with a 216 majority vote and Nida Davidson won the nomination for District 5 Executive Chairwoman uncontested. 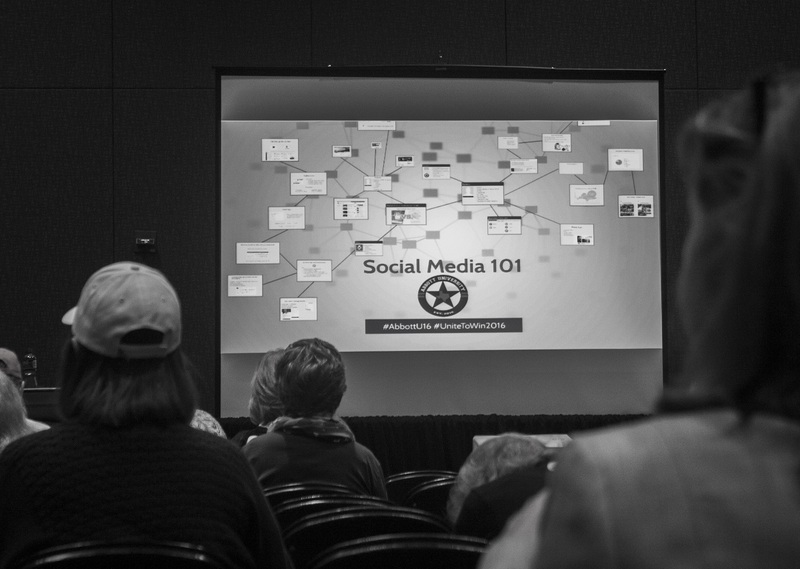 …and Kaitlyn, Brian and Megan attended the social media class. 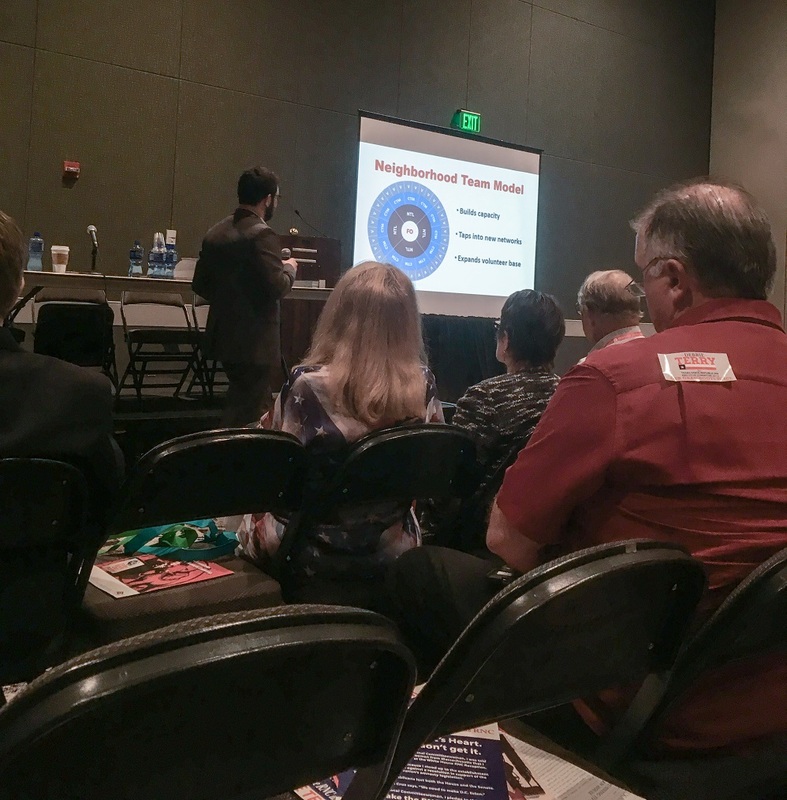 While organization building was a class to help expand an organization and mobilize resources to maximize influence, social media would help us learn about amplifying messages and maximizing reach with conservatives on the most effective social networks. One of my (Karla) favorite pieces of advice during the class was “ask and shut up”. It is similar to the salesman’s mantra of to stop speaking after the sale is made, but I never realized how much of a difference this can make. This is the best way to ask for a commitment from a volunteer, sponsor, or a voter. We also got plenty of advice for one-on-one meetings, including tips on how to make a personal connection during meetings. To achieve a personal level the first thing that is needed is to begin with our personal story, then the other person will most likely proceed to telling their story, in which case we can listen and better understand the person with whom we are communicating. After this, we can “ask the question and shut up” and hopefully get a commitment from them that will help us towards our goal to expand and mobilize resources. Once we had all shared our different learning experiences over lunch, it was time for more action at the Third General Session. 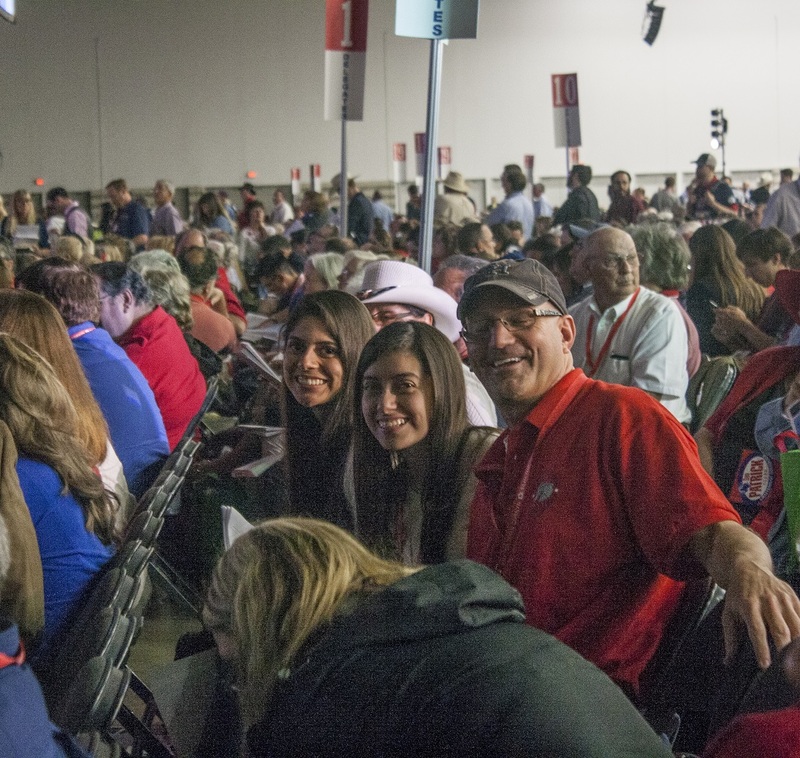 The Second General Session was postponed and combined with the third due to committee meetings running behind. However, the Third General Session was by far the most interesting session! It began with business from the second session–approval of the committee updates. This included the Report of the Permanent Chair, Adoption of Agenda & Supplemental Rules, Report of the Permanent Organization Committee (on which Professor Yawn served), Report of the Permanent State Nominating Committee, and Presentation of Incoming State Republican Executive Committee Members. This portion of the meeting was quick and easy, although the Rules portion got a bit acrimonious. Not, however, as acrimonious as the policy platform debates! Many Republicans were passionate about their principles and beliefs and they expressed that by debating for or against certain planks. The planks varied from educational and judicial power to issues such as abortion. The most heated of the debates was on whether to secede from the US, an issue that is a trifle bizarre to us. The whole secession thing has pretty much been settled. But parties are made up of diverse elements, and the zealous of these elements tend to be the ones who go to convention. The entire discussion not only included debate, but the opportunity to amend each of the amendments–all 266. It was a long process, however, the LEAP Ambassadors were grateful to have attended Parliamentary Procedures Process training and it was easy to differentiate those who attended and those who did not. Those who did not attend, in my opinion, prolonged the process because they had to verify the rules frequently and were “out of order” many times. It was also beneficial to us because we followed the meeting fairly well and enjoyed ourselves. We did not expect to see the heated debates in the session, but it was both interesting and entertaining. After much debate, there was a majority vote to end all debate (which many were ecstatic about; others were very unhappy about) on the entire platform, which then allowed us to participate in the first-ever use of Scantron voting for each plank in the platform. Even though it took us a while to read through all 266 planks and vote, we felt pride in preforming our delegate duties. I think the LEAP Ambassadors took a lot away from today. The session really showed the spectrum of issues and the varying level of support for both the sensible and strange policies that had been proposed. 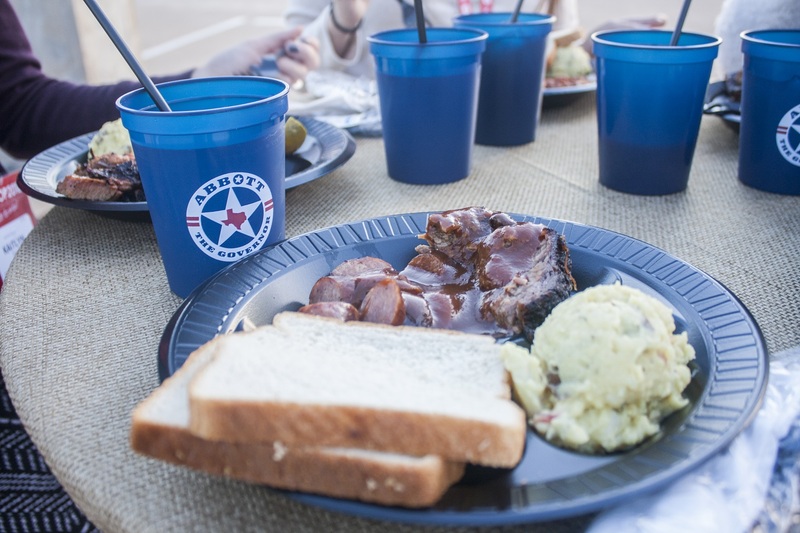 Once we were all finished voting, we took a short drive from the convention center through downtown Dallas where Governor Abbott hosted his tailgate on a parking garage rooftop overlooking the city. Upon our arrival we were presented with our Abbott University Diplomas and directed upstairs. 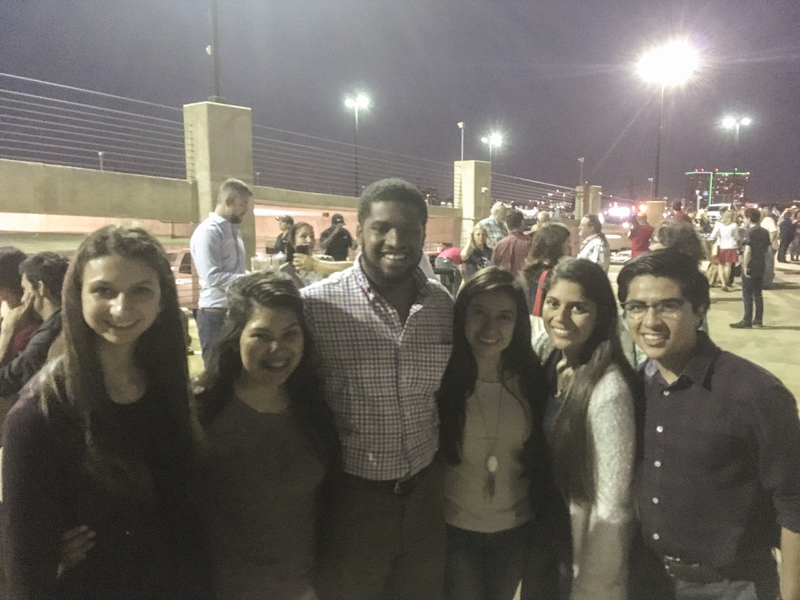 Blake Roach, (one of our favorite JF/LEAP Alums), who works as Governor Abbott’s advance man, welcomed us shortly after we arrived. 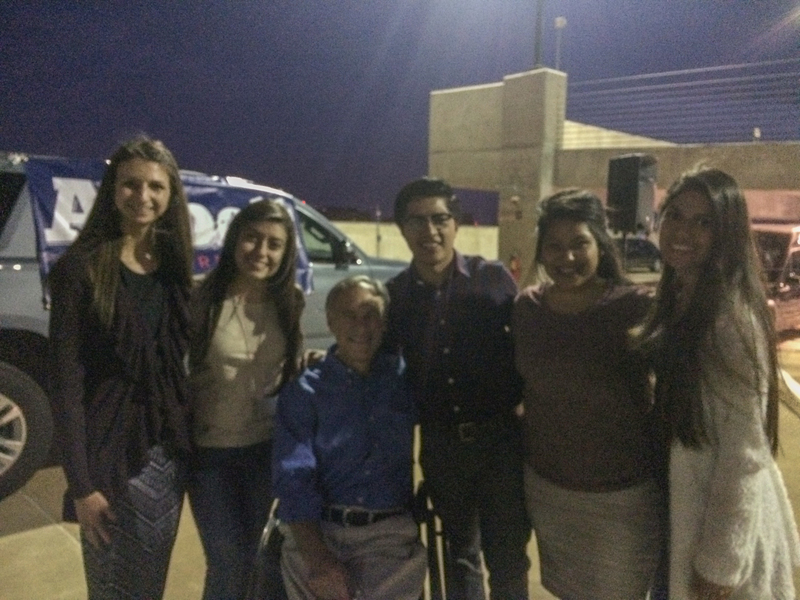 He explained his responsibilities as an Advance Man and his experience working with the Texas Legislature. Blake was nice enough to introduce us to Audrey Abbott, the First Daughter of Texas. She is now a college sophomore, so we had many things in common. Well, other than the fact that her dad is the Governor of Texas, of course! She was personable and easy to talk to. She told us about what her experience as the first daughter of Texas has been like and let us know that Governor Abbott had actually filmed a campaign advertisement in the same parking garage two years ago during his campaign for Governor! 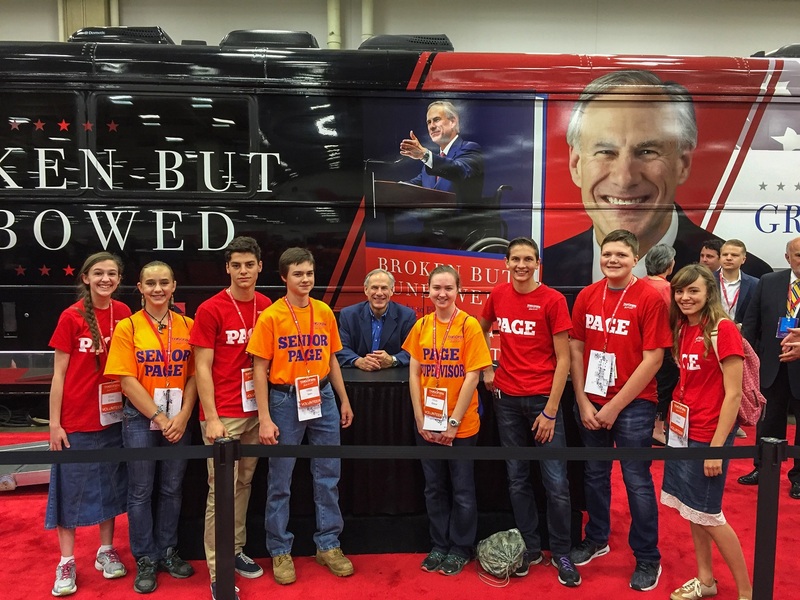 we were welcomed by Governor Abbott himself! On this one, though, Ryan Brim already had us beat, having met the Governor earlier in the day. It was a great event and fun way to end an eventful day. 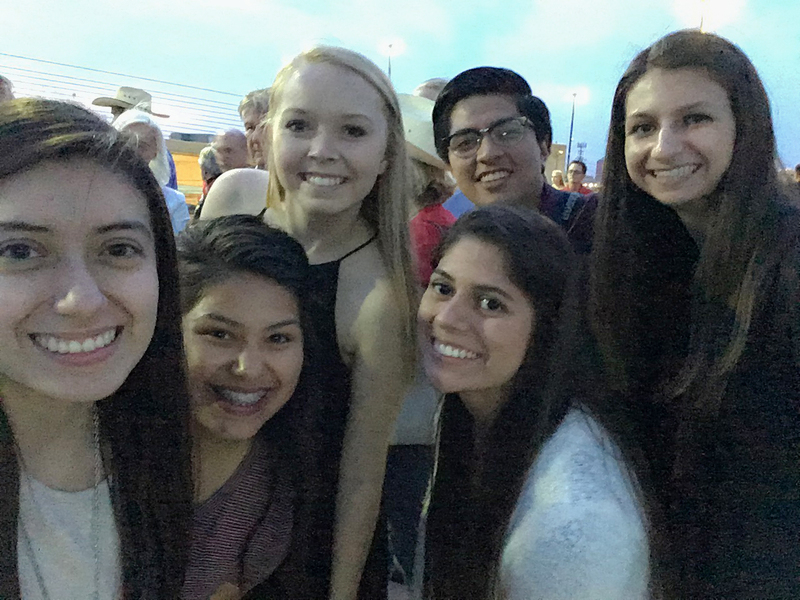 Knowing we would be back early tomorrow morning, we hurried home to get some rest before our final day of the State Convention.